In October 2018, for the third year, I had a story in the Science Fiction Romance anthology Pets in Space. At an interstellar crossroads hotel, a lonely starliner pilot and a passenger’s mistreated consort discover that they have the same destination: the intersection of danger and desire. Today, October 10, 2017, the second book in the Pets in Space science fiction romance anthology series came out. This edition includes my short story, Mascot. A portion of the proceeds goes to Hero-Dogs.org which is a great organization serving a great cause. I viewed the August 21, 2017 total solar eclipse from a unique vantage point: an unnamed peak two hours south of Cody, WY by dirt roads. – Wow! I moderated or was a panelist in several fascinating panel discussions at AmadilloCon 2017 in Austin, TX. It’s always worth interrupting a busy life to connect with like-minded readers and writers, and it’s fun, too! I participated in a Science Fiction/Fantasy panel at the 2013 Waco Cultural Arts Fest. The other SFF writers on the panel were Patrice Sarath and Bryan Gifford. In July 2013 I was a guest at the World Science Fiction Convention in San Antonio, LoneStarCon 3.It was a terrific WorldCon. In October 2012 I was a guest at the amazing Steampunk convention Octopodicon in Oklahoma City. In July 2012 I was a guest at ArmadilloCon in Austin – always an incredibly rewarding convention. In January 2012 I was a guest at ConJour in Clear Lake City. It was wonderful fun with kindred spirits. In June 2011 I went to Salt Lake City and Yellowstone to research novels. I also soared in the Tetons, thanks to Teton Aviation in Driggs, Idaho. It was a fabulous trip. In early April 2010 I researched locations for a new novel by going to Salt Lake City Utah, with side trips to Promontory Summit and Red Rock Pass in Idaho. March 26-28 2010 I was a guest at Comicpalooza in Houston, a multi-format convention celebrating not just comics, but also sci-fi and fantasy, horror, steam punk, New Media, movies, film, and gaming of all types, at the George R. Brown Convention Center. In 2009 I researched an upcoming novel with a trip to Seattle, Tacoma and Steilacoom, Washington State, and Portland Oregon. Mary Rosenblum showed me her wondrous part of the country, including the Columbia River Gorge, where she set her SF novel Drylands. 2009 also gave me the pleasure of taking part in ApolloCon in Houston and ArmadilloCon in Austin. My novelette “Quickfeathers” appeared in the May 2009 issue of Analog Science Fiction & Fact. This story is a sequel to my novel Hurricane Moon: set in the same world a few years later in the young colony’s history. My story “The Listening-Glass” appeared in Diamonds in the Sky, an anthology of astronomy-based science fiction funded by the National Science Foundation and edited by astronomer and science fiction writer Mike Brotherton. In the summer of 2008, I took part in ApolloCon, June 17-19; Denvention, the World Science Fiction Convention in Denver, August 6-10; and ArmadilloCon, August 15-17. Great conventions all! My fantasy story “Grass Lion “appeared in the February-April 2008 issue of Sorcerous Signals. In 2008 I was the Vice President of a Houston-area blended-genre writers’ group, The Final Twist. My story “The Mortification of the Flesh” appeared in the anthology Horrors Beyond 2 – Stories of Strange Creations from Elder Signs Press in October 2007. To my great delight, I’m hearing from readers who like Hurricane Moon. They include science fiction readers and others who usually read mainstream, fantasy, romance, or mystery. So on October 19 I appeared at Houston’s mystery bookstore Murder by the Book, along with other writers in The Final Twist. That’s the local chapter of Sisters in Crime – and a wonderful writers’ group. Copies of Hurricane Moon have been shipped to bookstores. And to me. And it’s wonderful to hold a copy of my novel in the form it was always meant to have. After years of being notes, sketches, Word documents, printouts with comments scribbled in all colors of ink; notebooks and binders with the MSS formatted and printed out for friends to read; the final draft boxed up to go to my agent in the mail; a digital MSS e-mailed to the editor and then sent to the publisher on CD’s; the copy edited manuscript, electronic galleys in PDF, and Xeroxed galleys, now finally, simply, it’s a book. Hurricane Moon got an excellent review in Publisher’s Weekly (scroll to the SF/Fantasy/Horror section). 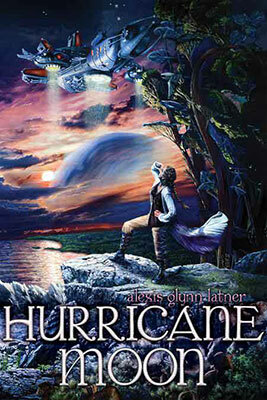 Take a look at Hurricane Moon’s wonderful, complete cover painting by Brian W. Dow. Go to http://pyrsf.blogspot.com/2006/10/for-your-viewing-pleasure-hurricane.html. My novelette Witherspin appeared in the July/August 2006 issue of Analog Science Fiction and Fact magazine. The April 2006 issue of Analog included my Fact article “The Shape of Wings to Come.” It was wonderful fun researching and writing this one about the future of soaring flight. I had a short article in the Soundings column of the December 2004 / January 2005 issue of Air & Space / Smithsonian magazine. “Picking up the Pieces” tells how NASA’s Genesis solar wind sample return mission was saved by the Johnson Space Center curatorial team after Genesis crashed in the Utah desert. “Houston’s Engine of Ingenuity” appeared in the Spring 2004 issue of the University of Houston’s Collegium Magazine. I thoroughly enjoyed interviewing the remarkable Dr. John Lienhard, creator and voice of The Engines of our Ingenuity, the Public Radio show about technology. Engines originates at KUHF on the UH campus. My article “Ounce of Prevention” appeared in the May 2004 issue of Soaring Magazine. This article concerns the surprisingly exciting topic of glider preventive maintenance. Ethical Dilemma: Can Ethics Be Taught? I interviewed the Dean of the UH Law School and faculty in Business and Philosophy for the Spring 2003 issue of the University of Houston’s Collegium Magazine.